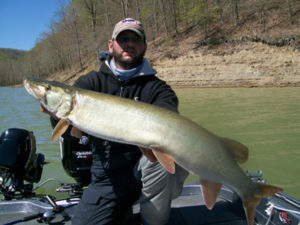 A combination of a cold front, falling water levels, unstable weather and spawning muskies made for a tough bite as the Professional Musky Tournament Trail opened its 20th season on Cave Run Lake April 28-29. Brian and Tim Barker with their first place trophies. Nearly 200 anglers in the Vitaminerals Spring Shootout found the lake three feet above normal levels but dropping, with 57-degree water and two- to three-foot visibility. Saturday added to the tough conditions with high winds up to 25 mph, which made boat control difficult. In exciting fashion, the team of brothers Tim and Brian Barker, both of Morehead, Kentucky, rallied from 10th place on Day 1 to the championship by tournament’s end. 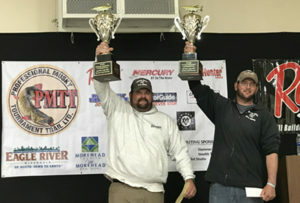 Their 31 1/4-inch musky on the first day got them in the running, and on Sunday they managed a double by boating a 38-incher for the victory in the first PMTT event in which they had competed. The Barker brothers caught their fish by casting black jerkbaits in shallow water and jigging Bondy Baits 15 feet down around baitfish pods in standing timber. They earned $15,000 and two first place trophies. In second place with a 42 1/4-inch musky — which was the big fish of the tournament worth $500 — were Chris Riebe of South Elgin, Illinois, and Matt Snyder of Tower, Minnesota. They used Lungen Lures .22 Long and .22 Short crankbaits in perch and chartreuse colors while trolling just outside and over standing timber that held baitfish. Tim Barker with the 38-inch musky that earned the first place finish. Third place went to Darrel and Lance Seasor of Ashland, Kentucky, with a 39 3/4-inch musky caught while jigging a chartreuse Bondy bait in 14- to 20-foot depths in standing timber with baitfish nearby. Placing fourth with a 39-inch musky were Jason Ritchie of Stanton, Kentucky, and Scott Salchi of Wellington, Kentucky, who caught their fish from a shallow shelf on a small Slammer crankbait. In fifth place were Joe Restivo of Indiana and Bob Vandermeer of Toledo, Ohio, with a 38 1/2-inch musky caught on a lemonhead-colored Slammer crankbait. They caught their fish early in the morning in two feet of water. A total of 18 muskies were caught in the tournament. Tournament director Tim Widlacki thanked all of the PMTT’s sponsors, especially Vitaminerals, for sponsoring the tournament, and Morehead Tourism for hosting the event. Also, Widlacki thanked Ranger Boats, Mercury Marine, Musky Hunter Magazine, Eagle River Area Chamber of Commerce, Keyes Outdoors, Chaos Tackle and all of the associate and contributing sponsors. Next up for the PMTT is Mercury Marine’s Summer Challenge in Eagle River, Wisconsin, June 23-24. For more information, visit promusky.com or call the PMTT office at (815) 478-4092.